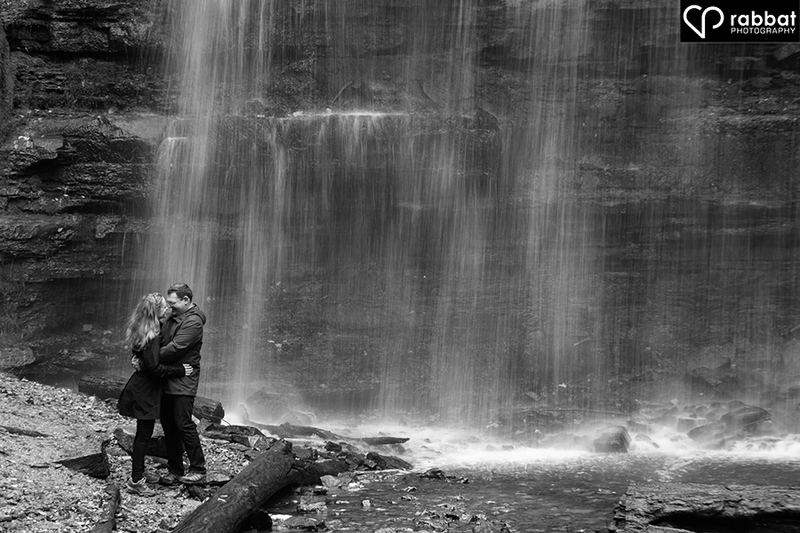 Christopher and Shannon suggested we take their engagement photos in Hamilton, which I learned is the waterfalls capital of the world. http://www.cityofwaterfalls.ca/.They were also totally happy to brave the rain for their engagement photo session, which was awesome because it was super crowded until the rain started and the park pretty much cleared out as soon as anyone felt a drop on their shoulder, except for us, of course! Christopher was afraid he wouldn’t give me any natural smiles during the photo session, but all it took was kisses from Shannon! In fact, sometimes just looking at her made him smile. We went to three different waterfalls and when we were done, we were soaking wet, but it was totally worth the discomfort for these photos. Thanks for introducing me to the waterfalls capital of the world, Chris and Shannon! Extra special thanks to Jeniffer Viera for assisting. I could not have gotten those raindrops to show up in the following photo without her! Christopher and Shannon did not mind snuggling under this umbrella together. There was a large crowd of people in front of these waterfalls until the rain scared them away. There was fabulous scenery and light in the opposite direction of the waterfalls as well. This location offered so many opportunities for engagement photos! Christopher and Shannon stayed very still so that I could use a slow shutter speed and get that soft, flowing water feel.My shutter speed was just 1/10! it from Andrea and Ian’s wedding. There is always time to be a little silly together. 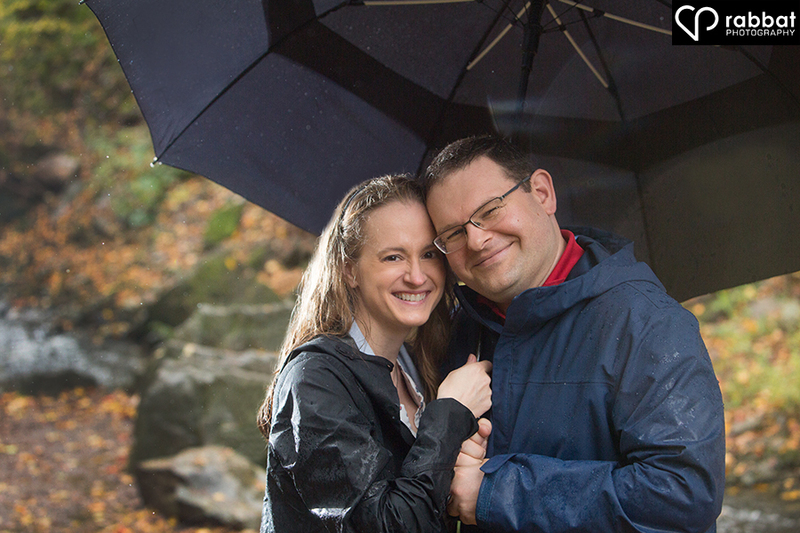 Christopher and Shannon told me they loved camping and the fact that they did their photos in the pouring rain with smiles on their faces, shows that love of the great outdoors, no matter the elements can come in handy even during an engagement session! 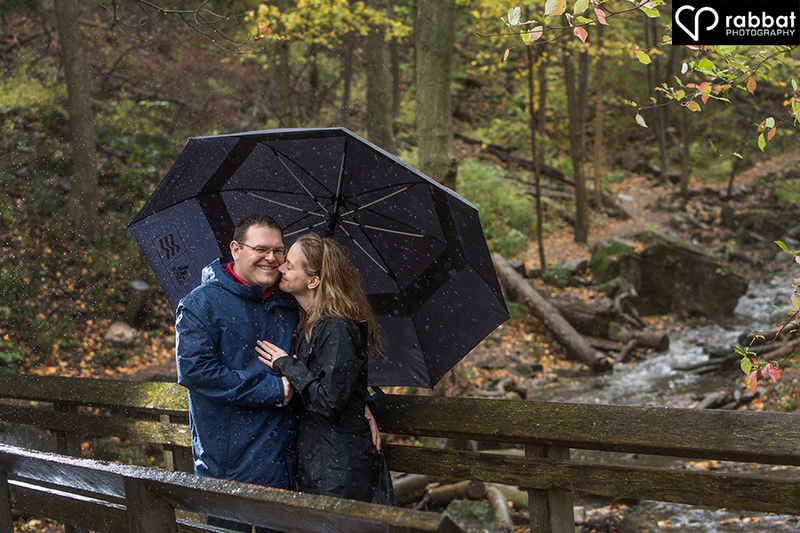 Congratulations again on your engagement and thank you for introducing me to the waterfall capital of the world! Thank you also for being up for anything.